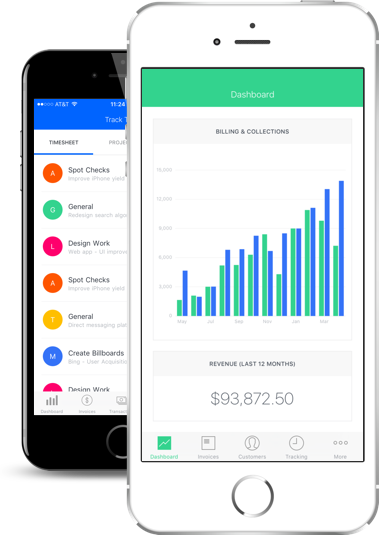 If you’ve been searching for invoicing software that can keep you online, organized, and competitive, look no further. 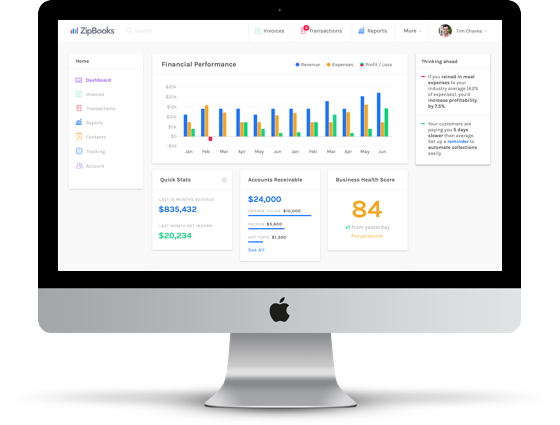 Sign up for ZipBooks with just your name and email, and you can have access to some of the quickest, most professional accounting software around. Small business accounting services can be expensive. 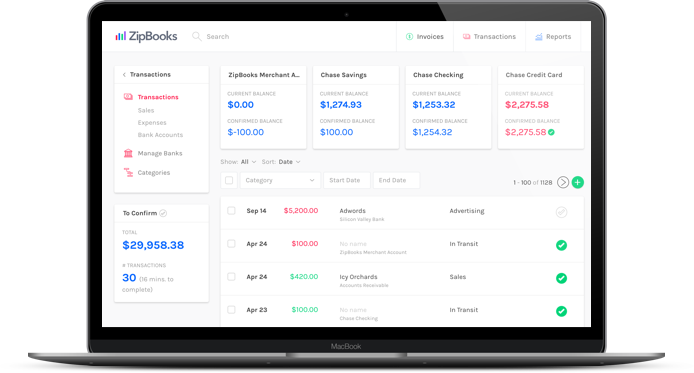 Finding free software that makes accounting accessible isn’t an easy task, which is just part of what makes ZipBooks special. It’s completely free and accessible on any device. Imagine finding a cloud accounting software that can not only get you organized, but get you paid, and faster. Well, you already have. 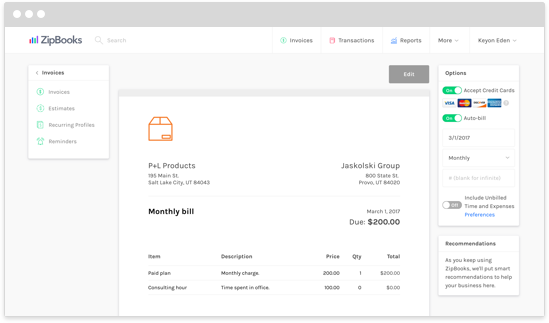 Sign up for ZipBooks and you’ll have free access to our free invoice template that can be sent to clients with the touch of a button. 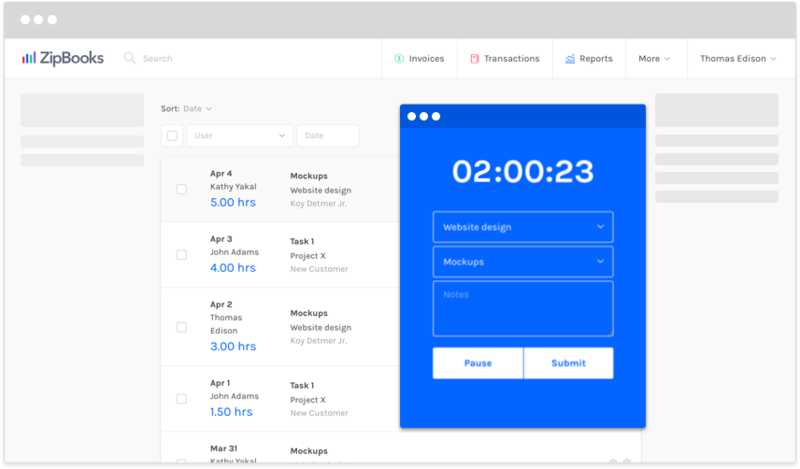 And what’s more, when your clients receive a customized ZipBooks invoice, they will have the option to pay right from the email they were sent. Forget delays and discrepancies, now payment can be fast and hassle free for you and your client. Regardless of your job or profession, ZipBooks can help. Track your time, add special projects and tasks to your account, and do this all from your mobile device or computer. 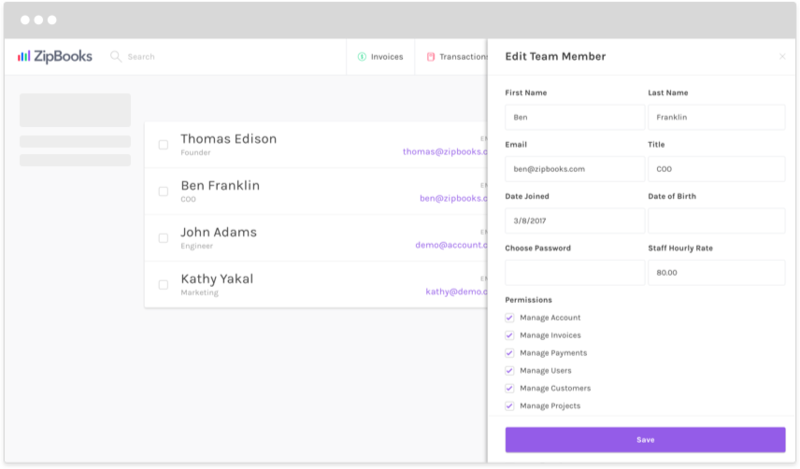 Add team members and assign them to specific projects and tasks within ZipBooks. Bring the whole team onto the same page, and assign permissions so that these team members can only access what you allow them to. And manage your accounting needs from the same spot with ZipBooks. Consider bringing your client into the loop too—include who worked on which projects in the invoices you send. Everyone will thank you for keeping things clear and up to date. And don’t worry, now ZipBooks can do your sorting and organizing. 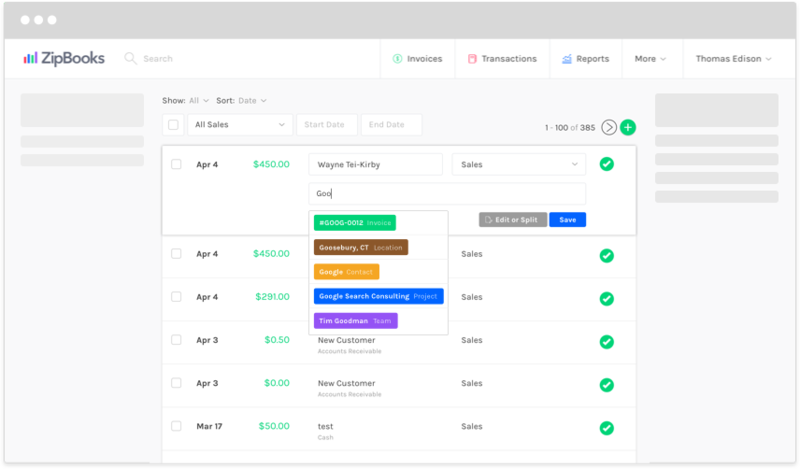 Simply record your business’s activities from your account and let ZipBooks keep it all straight. Do all of this and more with this free QuickBooks alternative, and don’t pay a penny. Charging clients using credit cards is now simple for both parties. And the simpler payment is, the better off your cash flows are. Simply sign up for WePay through ZipBooks (yeah, it’s free). The process is quick and easy and you can begin sending money back and forth instantly. Send an invoice by drawing your projects and tasks together for one client. You can charge per hour or per project or task, it’s all up to you. Once your invoice has been paid have it directly deposited into your bank account. Anything deposited before 4pm EST will appear before five business days are up. Say goodbye to the days when you forgot to bill for something. Keep track of it all on cloud-based accounting, and pull the details into the invoice when you bill a client online. Yes. It really is that simple. Just when you thought it couldn’t get any better—it did. Schedule invoices for clients who are regulars. 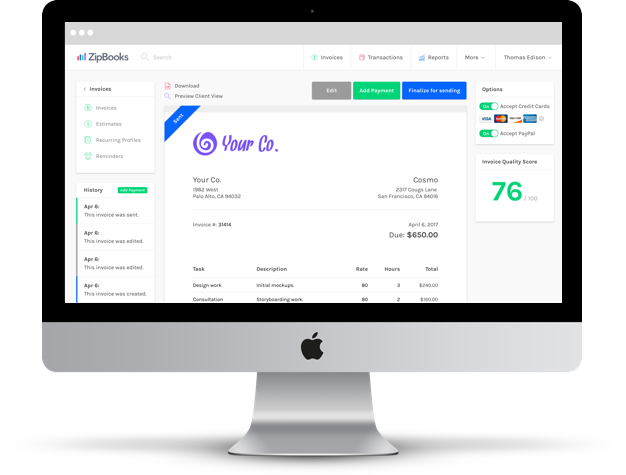 Schedule their invoice to go out weekly or monthly and ZipBooks will take care of it for you. One less thing for you to remember. It's easier to take a vacation when you use ZipBooks. You can visit anywhere with an internet connection, get your work done, and bill clients from your phone or laptop. The cloud platform makes ZipBooks easier than ever. Add as many clients as you want without paying an extra fee. Update your database as often as you get new customers. All you need is a current address, e-mail and phone number to create a new client.